The Cathedral Church of Saints Peter and Mary of Cologne is one of the most magnificent Gothic churches in the world. It is among the largest churches and it is one of the tallest; it is among the most ornately decorated. Its distinctive twin, openwork spires, are a marvel of Gothic design and a marvel of masonry construction. 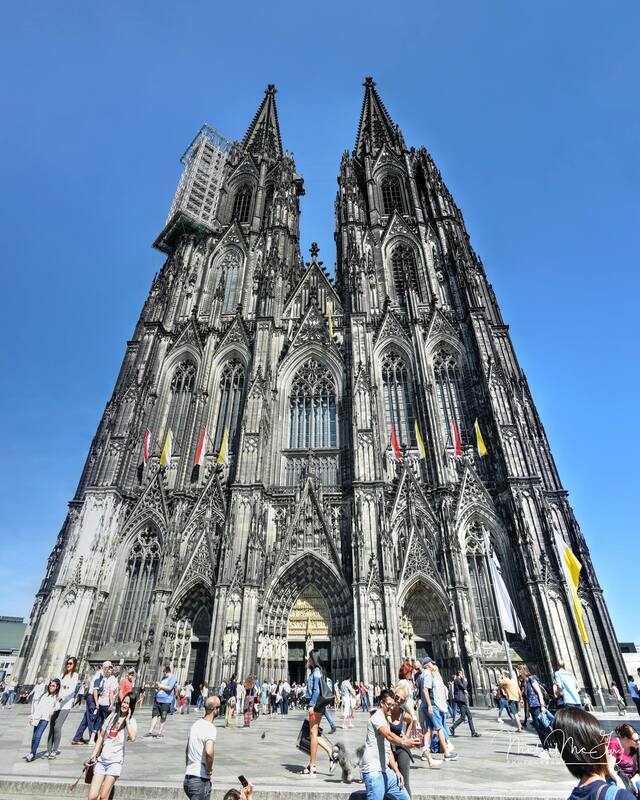 Cologne Cathedral houses some of the oldest and finest medieval artwork in existence. As befits so ambitious and complex an undertaking, it also took an extremely long time to complete. It was on this day 765 years ago, 15 August 1248, that the cornerstone of a new cathedral was laid in the German city of Cologne. It is well-known that medieval cathedrals took a very long time to build, with construction often spanning many decades or even centuries, but the span of the construction of the cathedral of Cologne may well hold the record. It would not be until 14 August 1880 that the final work would be finished and the cathedral formally complete, making the intermittent construction last exactly 632 years! Of course, it must be noted, that construction was not continuous for the entire six centuries. Construction came to a complete halt in the 15th century and was not resumed until 1840 after the fortunate discovery of the original medieval plans for the church. As with many building projects even today, the long pause in construction was brought about by financial concerns. Cathedral building was enormously expensive (see Henry Kraus’ “Gold Was The Mortar: The Economics Of Cathedral Building”; ISBN: 1566194210, for an excellent discussion of the financial aspects of medieval construction projects.) Because then as now, military demands took precedent over religious and cultural ones, Cologne could not fund further construction. For more than four centuries, the distinctive landmark of the city of Cologne was not a fine pair of towers, but a simple construction crane, which remained in place until the 1860s, and was used in the 19th century effort! A massive fund-raising drive was launched in 1840 to finance the completion of the cathedral according to its medieval plans. Though Germany would not become a united nation until 1870, the appeal was made across Germany and Austria. In a time of rising nationalism, the idea of completing a great German cathedral roused enthusiasm in all sectors of society, from mill workers and laborers to the royal houses of Germany’s many principalities and kingdoms. And the campaign was unprecedented in its ecumenism: Cologne is a Roman Catholic cathedral, and a great deal of the support came from the Catholic populace of Southern Germany and Austria, but it also found enthusiasts in Germany’s Lutheran North. It comes as no surprise that Bavaria’s Catholic King donated generously (sparing what he could from his own fantastic construction projects!) And it is equally unsurprising that Austria’s Catholic Emperor donated as well. But it is notable that Prussia’s Lutheran King committed his family and court to providing about one third of the required costs of construction. Ultimately the immense sum was raised – some estimate that it would come to nearly a billion dollars in today’s money – and the project was realized. When the cathedral was finished, the twin stone spires of its western front were the tallest man-made towers in the world. This distinction was short-lived, however, because the Washington Monument assumed that title upon its completion in 1884 (likewise short-lived, as it was far overtaken by the Eiffel Tower in 1889.) The accomplishment was treated as a national celebration in the recently united Germany, and the Kaiser himself attended the rededication ceremonies. During World War II, this glorious church was damaged by several allied bombs which landed nearby. Not far from the church was a strategic rail bridge which was the subject of several allied bombing raids. Given the state of technology during the war, it is fairly amazing that the damage to the cathedral was not worse. My father recalled a briefing before one such bombing raid: the crews were instructed to take every practical measure to ensure that the church was not hit. Apparently, they complied. But for many years the cathedral was marred by ugly, post-war repairs which stood out as battle scars, and served as a silent memorial to the violence of war. I was pleased to read that in the past fifteen years, major repairs have been completed. Last year a new rose window was dedicated, at last replacing the one which was lost in the war years. Today, the church looks very much as it did upon its completion in 1880. Because it has been identified as a UNESCO World Heritage Site, the city of Cologne has taken steps to ensure that modern construction around the cathedral will not overshadow the old church. Its impressive, dominating presence will be preserved. And of course, as with any old building, ongoing repairs are a necessity, and you will rarely find the building completely devoid of scaffolding or other signs of construction activity. Like a living thing, there is a constant need for repair and replacement. With preservation and protection, future generations may continue to enjoy the fruit of the medieval visionaries who first conceived of this great and glorious edifice, and continue to reap the benefits of the countless thousands upon thousands who contributed to its construction, and the efforts of those who maintain the cathedral today. Thank Goodness!